Shoulder conditions That may be affecting you! Patients value getting back to the activities they love, whether that is walking, running, skiing, or high-level sports. Prior to treatment, patients report that they are limited to 65% of their optimal function. After receiving treatment, they report averages up to 87%. The functional questionnaire represented here is the Disability of the Arm, Shoulder, and Hand (DASH). The number of patients reporting at these time-points are: 974, 693, 800, 742, 586, 452, 348, 242, 135. A main priority of Regenexx® is to decrease joint pain. Prior to receiving treatment, patients report average pain of nearly 5/10. After only 1-month, pain levels decrease to an average of 3/10, a decrease of 34%. Pain levels decrease further over time. The questionnaire used is the Numeric Pain Scale (NPS). The number of patients reporting at these time-points are: 1295, 716, 839, 766, 599, 459, 353, 246, 139. 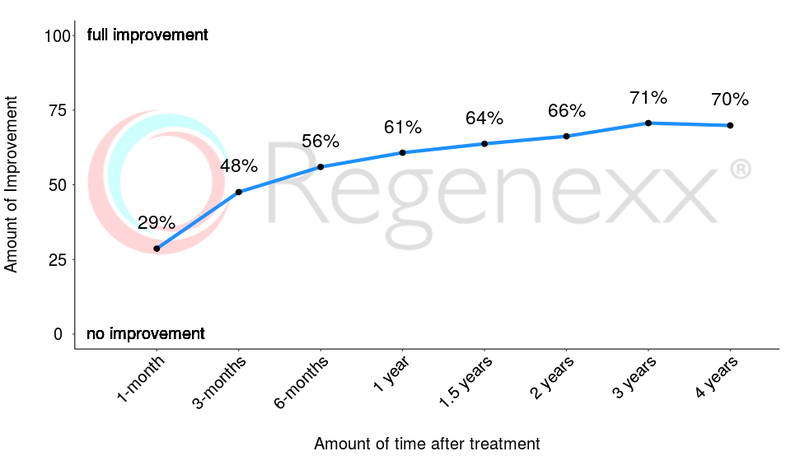 Patients feel their joints are already 29% better after only 1-month, and continue to improve from there. The questionnaire used is the Single Assessment Numeric Evaluation (SANE). The number of patients reporting at these time-points are: 727, 845, 785, 610, 468, 357, 247, 139.